This free theatrical performance will begin at 2:00 p.m. and will culminate in a playful reenactment of the storming of the Bastille. 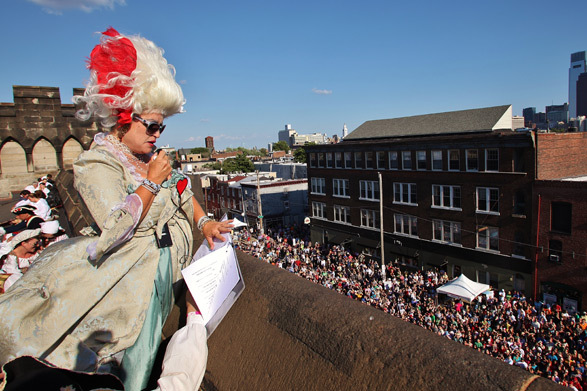 Dozens of French revolutionaries will storm the grim walls of “the Bastille” (Eastern State Penitentiary), will capture Marie Antoinette (portrayed by Terry McNally, co-owner of London Grill and Paris Wine Bar) and, ignoring her mocking cries of “Let them eat Tastykake!” will drag her to a real, functioning guillotine as 3,000 Tastykakes are flung from the prison’s towers. Following the beheading, local Fairmount restaurants will come alive with French-themed entertainment as well as food and drink specials, and the penitentiary will reopen for rare twilight tours at a discounted admission price.